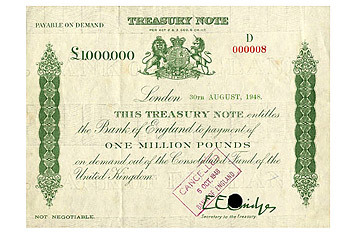 The largest banknote ever issued by the Bank of England was the £1,000,000 note, issued in 1948 as a temporary measure during the postwar reconstruction in the Marshall Plan. Designed for use by the U.S. government only, the notes were canceled after just a few months, allowing very few to escape into private hands. But just because the notes are out of service doesn't mean they're valueless  in 2008, one of two known surviving notes fetched almost $120,000 at auction. See pictures of 20th century Britain.